Welcome to another episode of the Radio Sai Study Circle. This is the 8th episode of this series which was started in September 2010. These episodes have been a very educative and elevating experience for all of us participating in this programme and we thank Bhagawan for this opportunity. The greatest inspiration for us has been your positive feedback on all our previous episodes. This is what our readers had to say on the previous episode which was on the theme Liking Swami verses loving Swami. Ms. Poornima Srinath: ‘This session made me understand that when the word ‘love’ becomes a verb in our lives it automatically leads to surrender and surrender ultimately leads to oneness with God’. Ms. Jyothi Ramchandra: ‘It was one of the best study circles I have heard. You discussed the heart of spiritual life which is practicing the teachings of the Master. It helped me to refocus on Baba’. Ms. Asha Nigum: ‘You are really conveying the message through excellent anecdotes. It is like reading a story with deep message but conveyed with fun and ease, do include more and more of His teachings in your programme’. The current study circle is on the theme: Swami on Sadhana (SoS). The participants of this edition are Radio Sai's Bishu Prusty (BP), and three research scholars from Baba's university, Amey Deshpande (AD), Sai Giridhar (SG) and K. M. Ganesh (KMG). The panel is moderated, as always, by Dr. G. S. Sri Rangarajan (GSS), who is the Controller of Examinations, Sri Sathya Sai Institute of Higher Learning. GSS: Welcome Bishu, Amey, Ganesh, and Giridhar. Sai Ram to all of you! So what’s today’s topic? SOS! Save our Soul? Yes. But in our context, it means Swami on Sadhana. Today we will be using anecdotes of Bhagawan, small but profound analogies given by Baba, such as “Hands in the society and heads in the forest”. Spirituality, in a very practical way, is all about being in the society and doing your duty, but internally being anchored in God. AD: Being in the world, but not of the world. GSS: That is correct. Not of the world. This is what we will talk about today. Swami on Sadhana – SOS! We’ll start with introduction to Sadhana. But first let’s understand what an analogy is. Swami says that when a small child cries without eating food, his mother cajoles it saying, “Look, look here, look at the moon”. She points out to the moon. The child looks at the sky with his mouth agape. The mother places a morsel of food in his mouth. Then she points out to a branch and says, “Do you see the moon over those branches?” But where is the tree branch and where is the moon? They are miles and miles apart. Bhagawan says even analogies should not be stretched too far trying to analyse and look into the nitty gritty. We need to grasp the message from these examples. BP: They are just a tool - a medium. SG: Yes. In fact every tool has its unique use. What a screwdriver does cannot be done by any other tool. SG: In the same way, every analogy has its role to perform. GSS: Giridhar, what is Sadhana? What does Bhagawan mention about Sadhana? SG: Before we get into the subject, I would like share a unique experience that almost every devotee who comes to Prasanthi Nilayam experiences. SG: As devotees drive towards the ashram from the railway station, their cars are often chased by stray dogs. BP: When man comes in search of God, Dog chases man! SG: Yes. Devotees come chasing God and dogs chase devotees! Bhagawan gives the most profound meanings to the simplest of everyday events in a sweet way to all of us. These dogs chase cars that are moving much faster than them – and would probably never catch up. Even when you stop your car, these dogs would give you a quizzing look as though to ask, “Why have you stopped?” They do not know why they chase the cars. Doesn’t man too run after this world without perspective? Sadhana is all about giving that right direction and perspective to man. SG: Swami also used to give an example of a panting dog. He would look at a panting dog and tell us, “Look at this dog. It has run hither and thither without knowing where its goal is. It is restless running around and pants as though it has done a lot of work”. Swami says Sadhana should not be like that. Sadhana is not labour. It is not about aimless wander. The goal of Sadhana is God, the goal of Sadhana is Love. Swami always says that God is bhavapriya, He looks at the feeling behind the activity. KMG: One should not lose the spirit. AD: We will soon start running around. In fact, starting next Tuesday, we will begin Grama Seva. At the end of the day, we would have run around so much! But would we have really understood the message behind Grama Seva? GSS: Sadhana is more of an internal than external practice. BP: Yes. The world today is full of people running around. Look at today’s generation. Youngsters think it is unfashionable to think of God, to sit and meditate even for 5 minutes! They think it is all very ancient. BP: Yes, but what we do not realise is that it is the most beautiful thing to do because it can fashion your life so beautifully. This is something which can actually bring happiness that is lacking in life. Bhagawan used to comment on how we do not view our ancient practices and spiritual Sadhana in the right perspective; He used to state the example of offering ghee and other items into the sacrificial fire which people laugh at and say it is waste of food material. Baba says it is as if saying the farmer who sprinkles seeds on the ground is a fool. What they do not realise is that what you offer to the earth, you actually get back ten times more. When Bhagawan explains this with such an example it becomes easy for a youngster to appreciate the importance of our ancient practices. Regarding Sadhana, many people are confused about the path to follow. They say that there are multiple paths – Karma, Bhakti and Jnana (Paths of Action, Devotion and Wisdom). Bhagawan has beautifully said that there are no separate paths. One cannot truly differentiate one path from the other. AD: I remember Swami comparing the three paths of Karma, Bhakti and Jnana to the three wheels of a tricycle or auto rickshaw. You need all the three wheels for the vehicle to move. You cannot say that one wheel is more important than the rest. However, you need one wheel to guide the other two wheels. 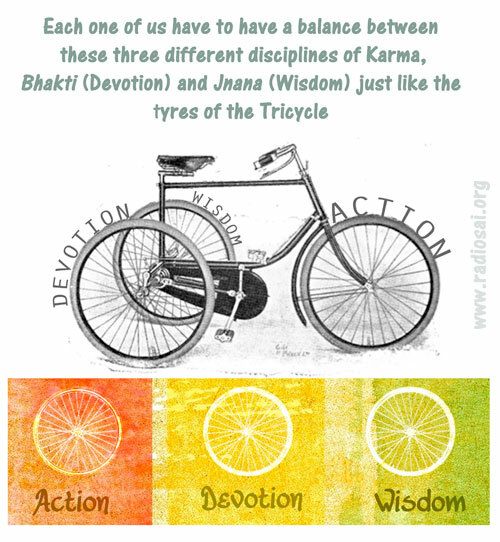 Each one of us have to have a balance between these three different disciplines of Karma, Bhakti and Jnana. It’s just that the importance we give to one path may be more than the other two. This differs among individuals. GSS: The ratio is different. AD: Yes. For some Bhakti is predominant. That is the wheel that guides their vehicle. So we really cannot say that one is purely a Bhakti Yogi, Karma Yogi or Jnana Yogi. BP: Yes. In fact as you were talking about this example of the tricycle, I was reminded of this beautiful analogy about the Indian sweet Mysore Pak that Bhagawan used to use. Baba says that this particular sweet has three aspects to it - sweetness, weight and shape. Now you cannot really separate one aspect from the other. You cannot just have the sweetness and remove shape and weight. You have to take a piece of the sweet in your mouth and experience the sweetness with your tongue. The shape would melt in your mouth and the weight would reduce. In the same manner, Karma is Bhakti, Bhakti is Jnana - you cannot really separate them. GSS: Yes, but as Amey says one path may be dominant for some people, while another path may be dominating for other - this ratio keeps changing. GSS: Sadhana is a very subjective and a very customised concept for every devotee. And the Master guides each one exactly on a very customised path which is meant for that particular individual. KMG: Not just from devotee to devotee, but even for the same devotee. GSS: Yes, at different points of time. BP: Different stages of evolution. GSS: In fact I recall a wonderful example that Bhagawan gave. Again He takes the mother-and-child instance. There was a mother with many children. One day all the children wanted juice, but one wanted red juice, another wanted yellow, yet another wanted green. What does the mother do when each child wanted a different colour? The mother prepared normal lemonade and poured it in different coloured glasses – red, yellow and green. The children were happy that they got the juice in the particular colour they wanted. And this is what Swami exactly does! He gives us what we think we want, but in that is hidden the real Sadhana that is meant for us - He guides us on a very customised path meant for each one. KMG: So one way of looking at it is that Sadhana should basically broaden our perspective. KMG: I am reminded of a very popular Nepali song which sort of resonates this understanding. KMG: The meaning of the song is that if we view the world through the lens of a flower, the world would appear like a flower. Whereas if we view the same world through the lens of thorns, the same world will appear like a thorn. As is the drishti (vision), so is the srishti (creation). 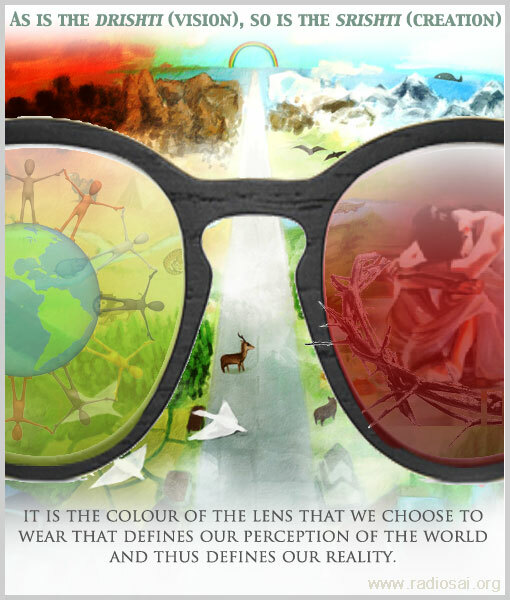 Bhagawan often says that it is the colour of the lens that we choose to wear that defines our perception of the world and thus defines our reality. GSS: What we basically understand from this initial discussion is that Sadhana is necessary. Sadhana is what really brings us closer to God. Bhagawan always used to give the example of a bank account. He said that all the good that you have done in the past brings you closer to God, but at the same time He cautions us that all the bad that we have done in the past is also pulling us away from God. So we must constantly keep doing more and more good actions. It’s like adding more and more money to your account otherwise at one point you will find yourself going overdraft. Therefore Sadhana is necessary. Even before discussing about the process of Sadhana, let us talk about the prerequisites. Are there any prerequisites? One important thing is affinity – a feeling to come closer to God. We may call it attachment to God and detachment from the world. Unless one has this mindset, it would be difficult to think of doing Sadhana. Amey, what does Bhagawan say about getting attached to God?